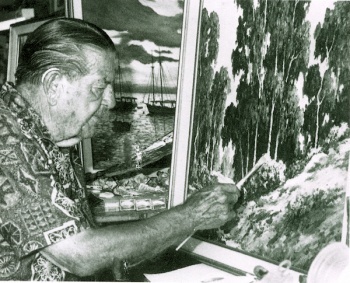 UPTON, Roger Moulton “Bud” (1900-1988), landscape painter, illustrator and cartoonist who lived on Santa Catalina Island much of his life. Born in Massachusetts, he moved with his family to Pasadena, California as a baby. He went to Catalina for the first time with his parents in 1902, and was never far away after that, often spending his summers there. From his earliest childhood, Upton was interested in art. In 1932, Upton and his wife, Betty, whom he had met in Catalina in 1923, moved to Avalon, where they were to spend the rest of their lives. As was the fate of many artists during those Great Depression years, Upton was unable to make a living exclusively as an easel painter, so he went into the sign business. He also painted murals, created decorations for tour buses, designed menus, and served as the all-around design and artistic consultant for many projects around Avalon and Catalina. 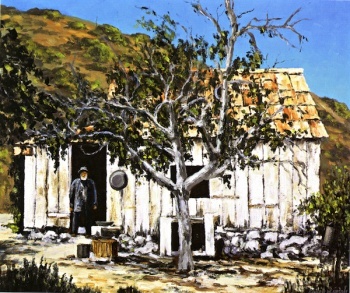 He and his wife opened a gift shop, where Upton's paintings were sold along with every kind of Catalina curio and gift imaginable, all handmade by Upton and his family. 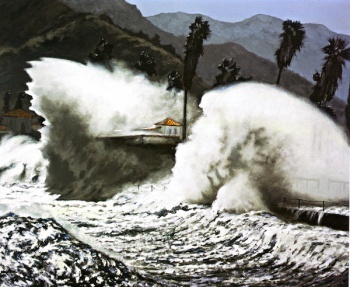 In 1958 Upton and a group of other Catalina artists formed the Catalina Art Association. Upton served as the organization's first president. 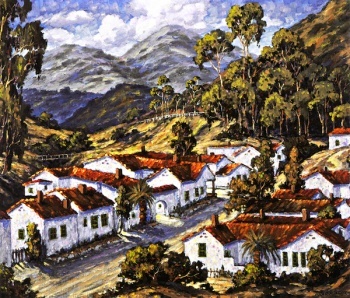 In that first year, the group started an annual Catalina Festival of Art, which has been held each September since 1959. 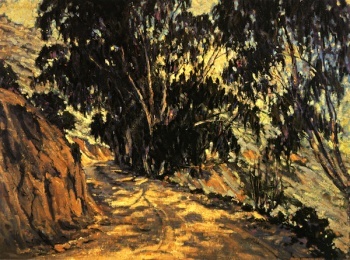 Upton painted in Avalon longer than any other artist to date. This page was last edited on 2 October 2015, at 20:22.